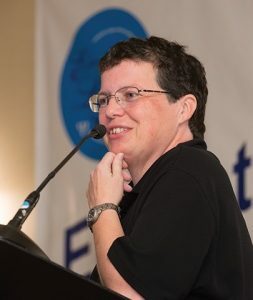 I’ve seen a lot of faculty desktops – both computer desktops and actual desk tops. It seems that for many of you, your approach to organization is to just toss it all on your desktop (or desk top) and hope for the best. And you swear that you’ll get both cleaned up over the summer, the same promise you’ve made to yourself (and the fire marshal) for the last 10 years. I can’t help with your desk top – actually I can. Just put it all in the trash and call it good. Really afraid you’ll need something that’s in that mess? Put it all in a box, date it with a magic marker, and store it above your garage. Now let’s do something about your computer’s desktop. DropIt is a wonderful little organizational tool. I’m working on fictional ProjectX. The first thing I’m going to do is create a folder for ProjectX in my Dropbox.com folder; of course I could put the folder anywhere. My file has suddenly disappeared from my desktop and is enjoying life in its cozy new folder safely tucked away out of sight. 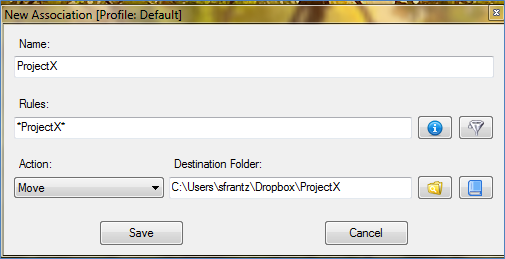 The next file that contains the word ProjectX that I drag and drop from any folder, not just the desktop, will automatically be filed in that same ProjectX folder I created. Once the rule is created, the file will automatically be moved. You only need to go through the process of creating rules if DropIt doesn’t have any rules that apply to the file or folder dropped onto it. While it’s the move function that I most appreciate, it’s not the only function DropIt has. 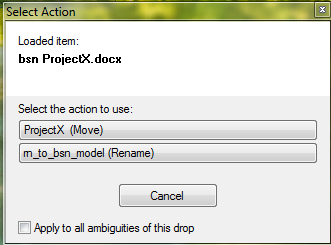 Click the button under “Action” to see other options, such as renaming, copying, and uploading. Here I have one file where I have two rules that could apply. 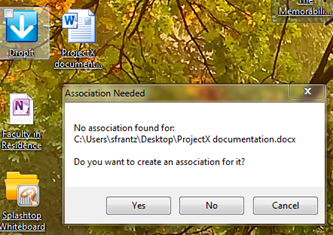 DropIt asks me which one I want and if I want this decision to hold for all files that meet these criteria. Clicking on the DropIt icon on the desktop generates another DropIt icon that floats on top of any windows you have open. Right-click on it and select “Associations.” You’ll see all of the rules you have created. Right-click on any rule to edit, copy, or delete it. Download DropIt. Get the files that you’re not currently working on off your desktop and into folders. Don’t wait until this summer. Or winter break. Or spring break. Now’s a good time. Really. I’m unclear whether this works to send something to resident folders–or just to Dropbox? You say, “The first thing I’m going to do is create a folder for ProjectX in my Dropbox.com folder; of course I could put the folder anywhere,” but your examples are for Dropbox and the program is called DropIt. Can I automatically drop something into my own computer’s folder? Sorry for the confusion! No, there’s nothing special about Dropbox here. This will work with any computer location.